Released last month as part of Shout! Factory's Shout! Select line (only available through their website) is another sought after episode of the classic series Mystery Science Theater 3000. Originally released in Rhino's MST3K vol. 4 set way back in 2003, this episode is finally available again on DVD. 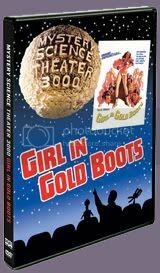 The Girl in Gold Boots starts off with a drifter named Buz on his way to Hollywood. He talks a beautiful waitress named Michele with an abusive father to come with him, partially because he is attracted to her and partially because he doesn't have enough gas money to get there. He promises her that he can get her a job at a dance club in Hollywood where his sister works. On the way there they meet up with Critter, a singer/guitarist who also has his eyes on the girl. Once they get to Hollywood, drama ensues and everyone's true colors are revealed. Mike, Crow and Tom Servo have their work cut out for them with The Girl in Gold Boots. The film, from B-Movie King Ted V. Mikels, is not only hilariously bad but very watchable. One problem with some of the MST3K episodes is that the movies the boys are watching are just so unwatchable that it makes sitting through an hour and a half episode tough. Girl in Gold Boots is an exception and the crew's witticisms are frequent and dead on for most of the film. Mike even does his own impression of Critter which was one of the funniest things I've seen in the series. Overall,one of the funniest MST3K episodes I've seen.